I just had this happen again on mine at 91k mi. P0234, P2263, P2599 just like the OP. Pulling 13k at WOT up a hill. Engine power reduced, pulled over, cycled the ignition and engine power back to 100% but CEL illuminated. After a few more ignition cycles the CEL went away on its own. I just took a peek under the hood and saw the cold pipe clamp where it connects to the turbo. I grabbed a 7/16" wrench and tightened it up... was pretty loose. Got the nut down another 1/8" or so. See pic. The clamp looks suspiciously new especially considering how dirty that boot is and I've never touched it.. Ya that's not normal, should be dirty. The other clamp looks loose to. It must be buried. I stick them both up so there easy to tighten up. Last edited by G2GBY; 05-04-2018 at 09:13 PM. All the other clamps as far as I can tell are crimped. I remember reading somewhere about the boots being crimped on with adhesive. If a boot blows off, you have to replace the whole boot / pipe. This came for my 2008 model but outlines how to seal the turbo piping. Some customers may comment on an engine oil leak from the rear of the engine near the flywheel housing. Upon further investigation, a technician may find oil in the charge air cooler or turbocharger air inlet adapter. Oil found in this system is very rarely an indication of a turbocharger failure. This condition may be caused by a loose clamp at the inlet duct/pipe located on the turbocharger. Oil may carry over from the PCV system and leak out the turbo inlet duct/pipe. Clean the rubber duct hose with soapy water and allow to dry. Apply a thin bead of high temperature RTV silicone sealant to the turbocharger compressor outlet port and CAC duct connections. Replace the turbo inlet duct/pipe and clamp with P/N 98011738. Replace the air intake clamp with P/N 97376379. Refer to Air Intake Pipe Replacement in SI. Do not replace the inlet adapter/duct on vans and medium duty trucks - only replace the clamp. My 3500 has around 130k on it. It is a 2016 cab and chasis. We haul heavy (goose-neck with 8 to 15k loads constantly. We run with the scanner plugged in to clear the code as it comes up before limp mode sets in. I have spent thousands at the dealer on this problem and the DEF issues ... ugh ... but still have the issues. P2002 is the main code but P2263 is a big problem when pulling up a hill. I have read this thread and still don't really know where to look. So what causes the LML to throw P2263 T/S Charger Boost Sys Perf code? I suppose a turbo leak test or a leak in the air intake system would be a starting point, but that's just a guess. Any direction that would help get me to a solution would help. 2016 Chevy 3500HD Duramax rwd flatbed pulling 40' gooseneck trailer as a hot shot operator. Lots of posts about P2263 Did you search??? I don't have any information about P2263 but here is some on P2002. Why not purchase a subscription to ALLDATADIY or other similar sites? Will save you lots of money and trouble. Diagnostic Procedure Instructions provide an overview of each diagnostic category. The particulates in the exhaust gases are collected by the diesel particulate filter (DPF). When the filter becomes saturated with particulates, they are oxidized by a regeneration process. The regeneration process increases the exhaust gas temperature, heating the diesel oxidation catalyst (DOC), and the DPF. The accumulated particulate matter in the DPF will then be safely converted to harmless gases and the DPF will then be clean and ready to filter additional particulate matter. The engine control module (ECM) monitors the system with inputs from two exhaust gas temperature (EGT) sensors 1 and 2 and a differential pressure sensor. This diesel particulate filter diagnostic provides a means for monitoring the exhaust particulate filter (EPF) efficiency. The resistive exhaust flow is monitored to determine if a DPF substrate is missing or a defined DPF failure has occurred. The resistive exhaust flow is calculated from mass air flow and DPF differential pressure. This diagnostic will run after a successful regeneration event has completed. This includes a successful service regeneration event. DTCs P0101, P0102, P0103, P0545, P0546, P0642, P0643, P0652, P0653, P0698, P0699, P2032, P2033, P2227, P2228, P2453, P2454, and P2455 are not set. A regeneration event must be complete. The vehicle speed is greater than 40 km/h (25 mph). The engine load is greater than 25 percent. Engine Run Time Since Last DPF Regeneration is less than 10 minutes. Distance Since Last DPF Regeneration is less than 30 km (18.6 mi). The Soot Mass is less than 40 grams. DTC P2002 runs once when the above conditions are met. The ECM detects that the particulate filter has degraded below a calibrated threshold for greater than 30 seconds. DTC P2002 is a Type B DTC. Verify that DTCs P003A, P0047, P0048, P0101, P0201-P0208, P0234, P0299, P02A1, P02A5, P02AD, P02B1, P02B5, P02B9, P029D, P0300-P0308, P0401, P0402, P046C, P0545, P0546, P2032, or P2033 are not set. If any of the DTCs are set, refer to Diagnostic Trouble Code (DTC) List - Vehicle. Verify that leaks do not exist in the exhaust system. Refer to Exhaust Leakage. Engine coolant temperature greater than 80°C (176°F). Command the EGR solenoid with a scan tool to 25 percent. Perform several accelerator pedal sweeps by rapidly depressing the accelerator pedal to wide open throttle (WOT) and returning the pedal to the at rest position, allowing the engine to return to idle speed for 5 seconds, while observing the exhaust from the tailpipe. There should be very light or no smoke visible from the tailpipe. If a heavy black smoke is observed from the vehicles tailpipe, replace the particulate filter assembly. Important: Perform the Repair Verification after completing the Circuit/System Testing. Improper installation. The exhaust differential pressure lines should have a continuous downward gradient, without bends or kinks, from the differential pressure sensor to the particulate filter. Improperly routed exhaust differential pressure sensor lines. 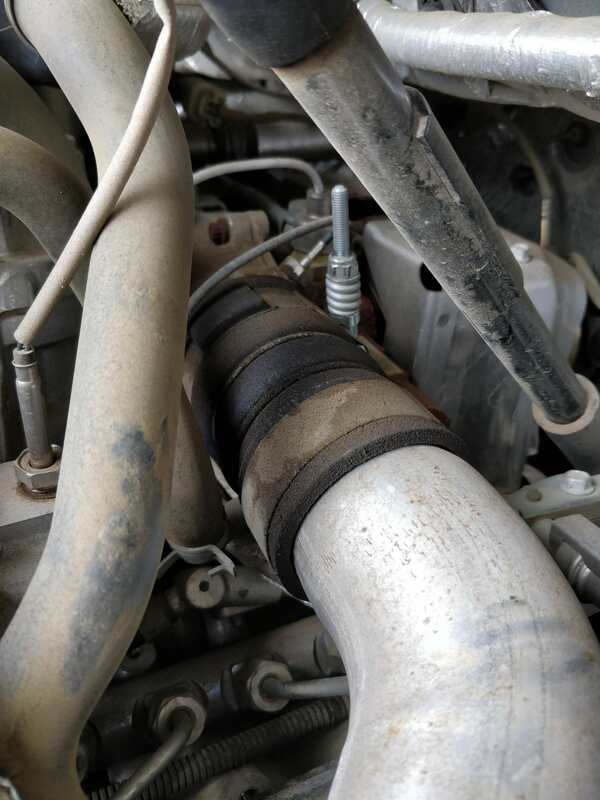 The smaller line connects to the front of the exhaust particulate filter and the smaller port of the exhaust pressure sensor. Remove the exhaust differential pressure sensor lines. Visually inspect the lines for restrictions. If a condition is found, replace the exhaust differential pressure lines. If a condition is found, repair as necessary. Test the charge air cooler system for leaks. Perform the Full System Air Leak Test in Charge Air Cooler Diagnosis (Full System Air Leak Test) Charge Air Cooler Diagnosis (Induction System Smoke Test) Charge Air Cooler Diagnosis (Charge Air Cooler Air Leak Test). If a charge air cooler leak is found, repair as necessary. Test the engine air induction system for leaks. Perform the Induction System Smoke Test in Charge Air Cooler Diagnosis (Full System Air Leak Test) Charge Air Cooler Diagnosis (Induction System Smoke Test) Charge Air Cooler Diagnosis (Charge Air Cooler Air Leak Test). If an induction air leak is found, repair as necessary. If the air intake system, exhaust system, DPF components, and the charge air cooler test normal, replace the particulate filter. Notice: Refer to Diesel Particulate Filter (DPF) Regeneration Enable Notice. Certain engine control conditions can cause the DPF to overload with soot. It will be necessary to clean the DPF as instructed to remove the excess soot accumulation. To avoid the customer's return to the service department, perform the appropriate Exhaust Particulate Cleaning procedure that is specified in the provided link. Last edited by Ron Nielson; 05-09-2018 at 09:08 PM. For P2002 you may try a service regeneration. If you have an Android device and a bluetooth ODBII scanner you can perform the service regen with Torque Pro and a plugin called BiScan for GM.